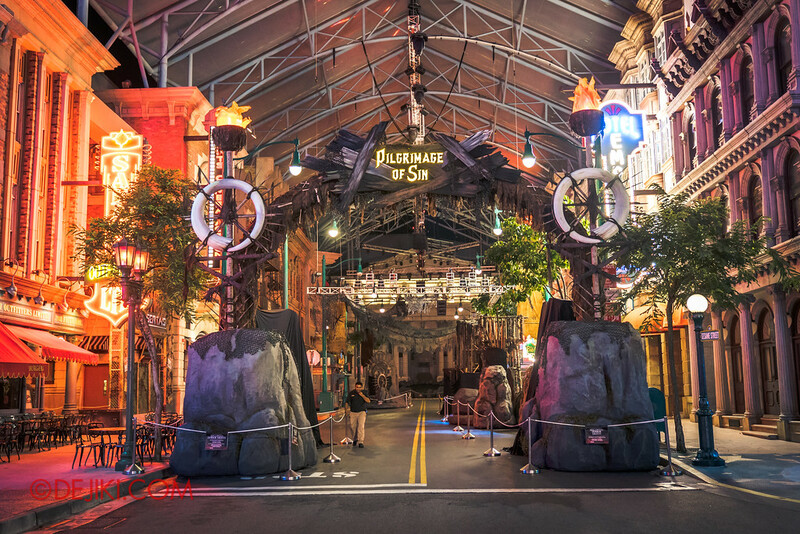 An overnight tent stay at Universal Studios Singapore with zombie attacks all night. 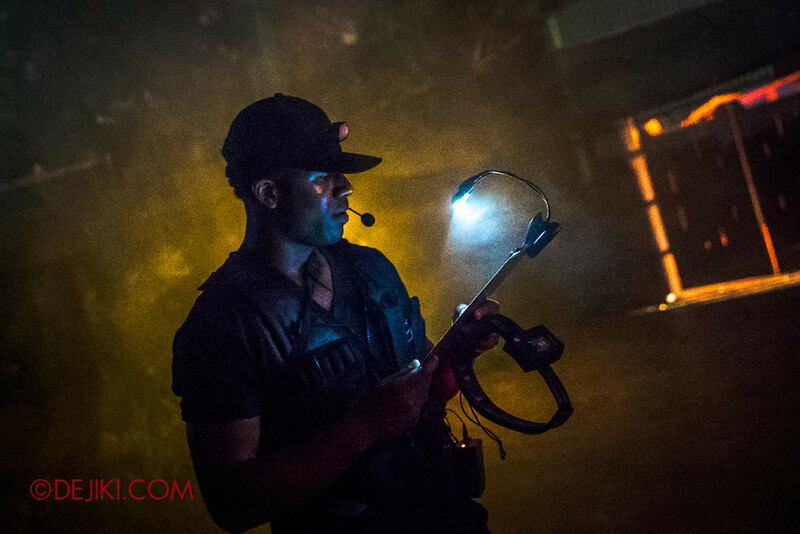 It’s the ultimate scare experience like no other. 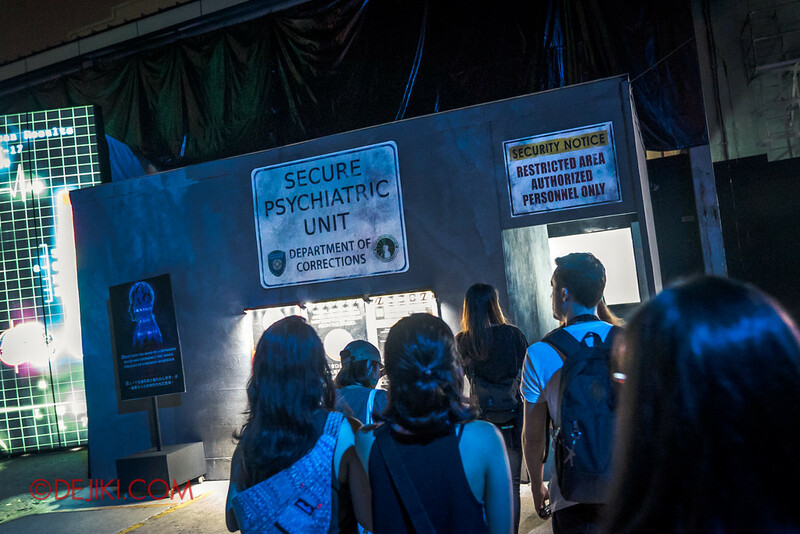 To kick off this year’s ultimate Halloween event in the region, Universal Studios Singapore and MasterCard held a draw for the Halloween Horror Nights 7 MasterCard Priceless Experience. 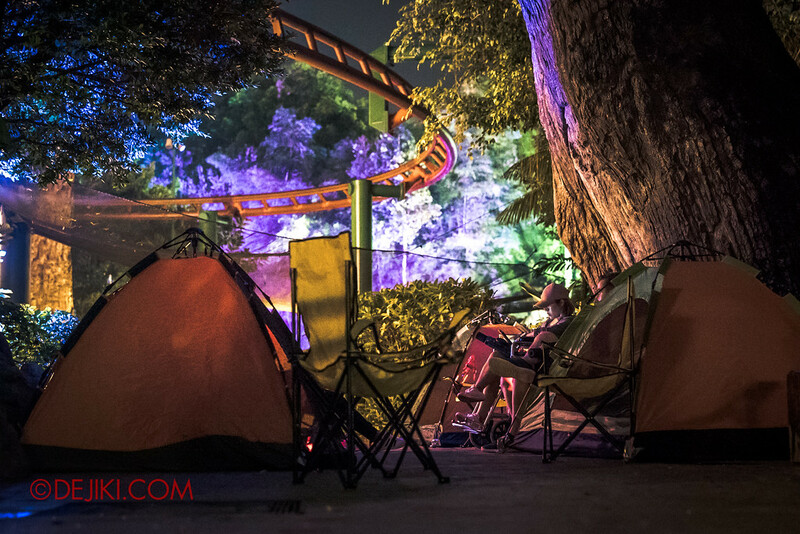 The prize will surely make HHN fans palpitate – an exclusive overnight tent stay in the theme park. 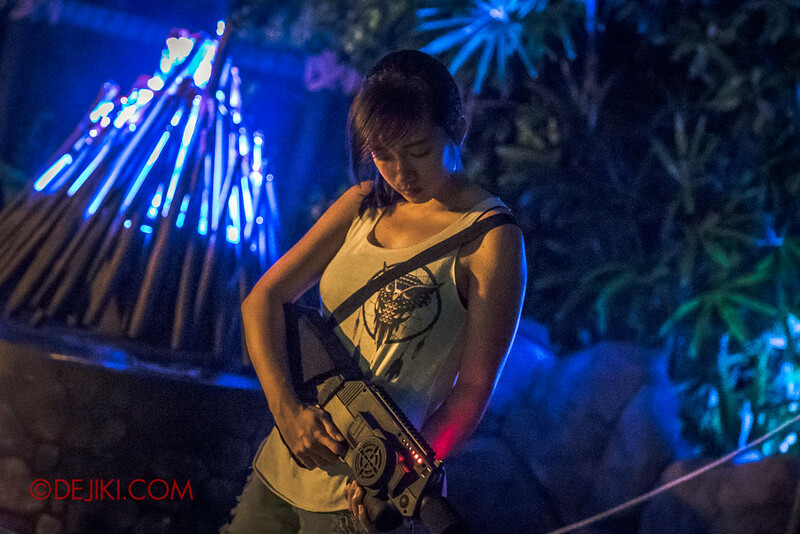 The winner gets to bring some friends along, and everyone get a first taste of HHN7 before it opened on 29 Sept. Lucky! Despite the number of tickets I bought (and helped to sell), I did not win the draw. 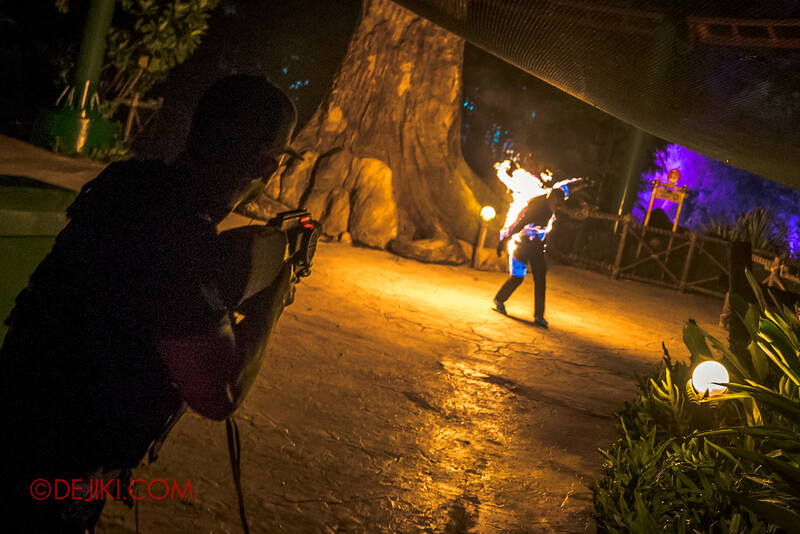 Thankfully, I was given a chance by Resorts World Sentosa to participate and I lived to tell the tale. And it was quite a tale – this is a Dejiki.com exclusive. 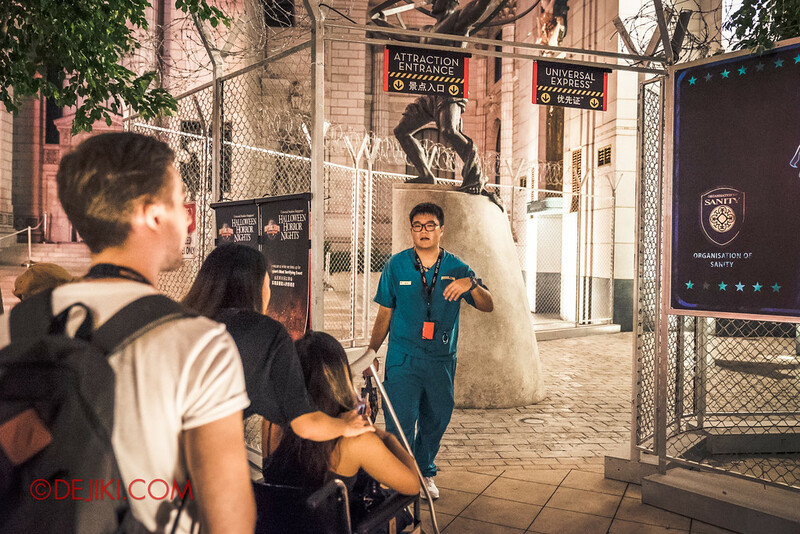 We gathered at Universal Studios Singapore after hours for the first segment – a tour through two haunted houses. It was eerie to walk around the park even with all the lights switched on. This was probably the only time haunted house walkthroughs of the Behind The Screams Tour were held at night, which made it both special and unsettling. For my fellow campmates, it was their first time visiting their houses, and they enjoyed getting a first look at all the details inside, without all the scares. In the first few hours of the experience, the park staff avoided telling us what was going to happen. They said they didn’t know who’s in charge of the next segment. After touring DEATH Mall and Inside The Mind, we had an uneventful stroll through New York, Sci-Fi City and Ancient Egypt. 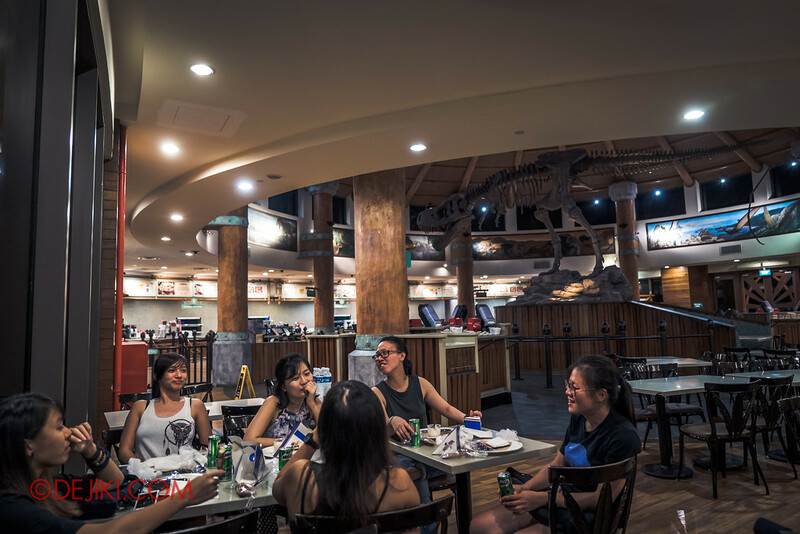 Then, at the Jurassic Park zone… this. Only a foggy, dimly-lit path to the campsite. 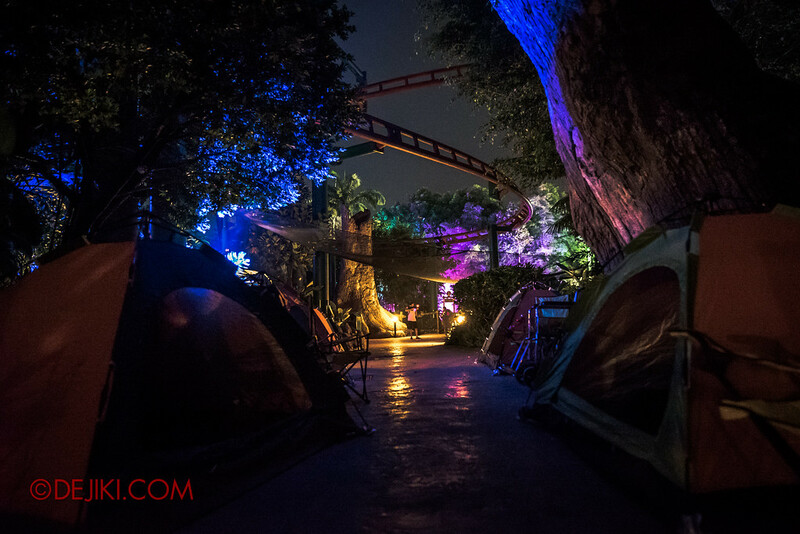 Cutting through the darkness of Jurassic Park, we made our way into the dreary campsite. Our tour guide, and the other USS staff, disappeared into the shadows. What’s going to happen? 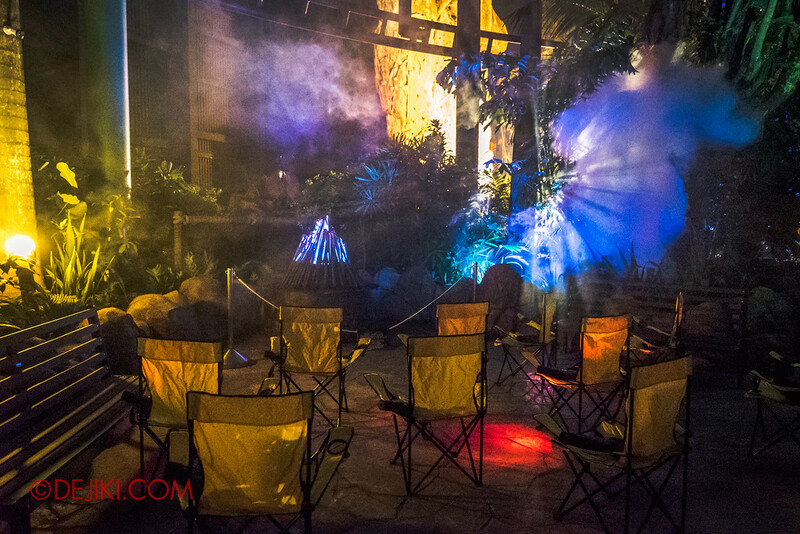 We then saw the gleaming red lights on the chairs. Just when we were going trigger-happy with the battle rifles (they were pretty loud), a soldier came to camp and hushed us. Oh finally, someone with authority. Sergeant John McCoy’s the name. The Sergeant explained that militant zombies will storm our camp till dawn. 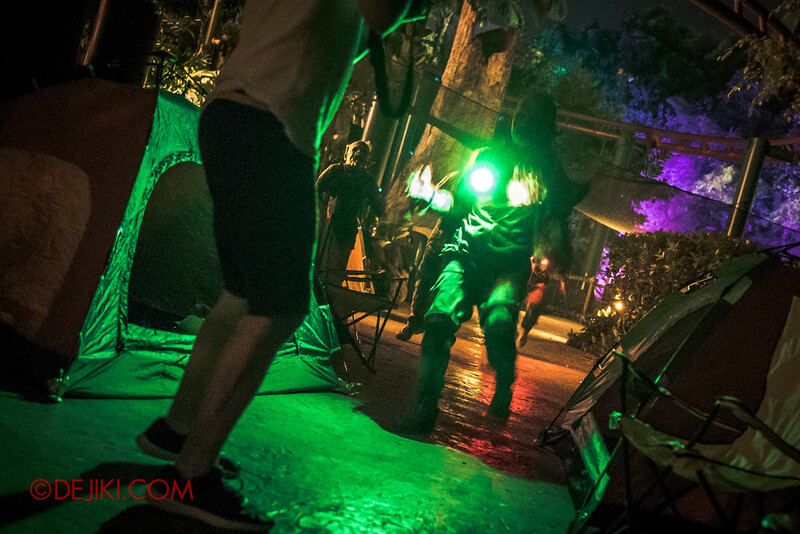 As the last human soldier left, he taught us how to defend our campsite with the laser rifles. 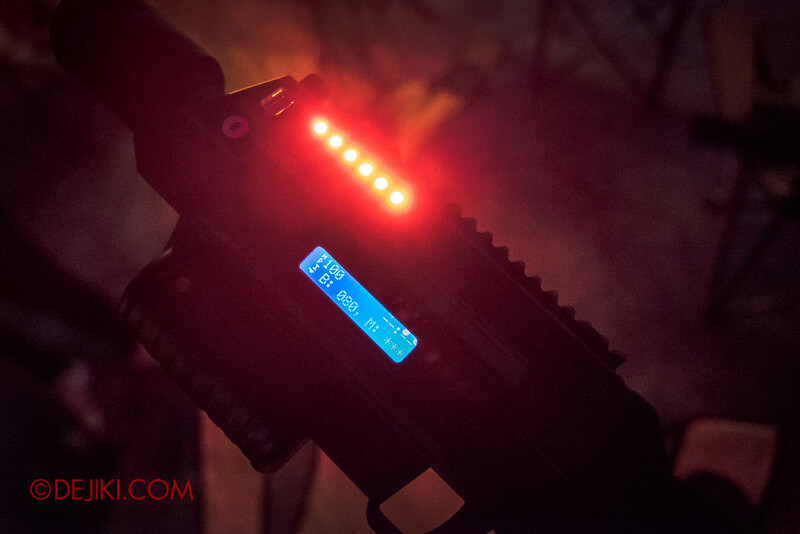 The lasers will only be able to paralyse and drive the zombies away. Once everyone cleared the the test fire, we chilled out at the campsite. 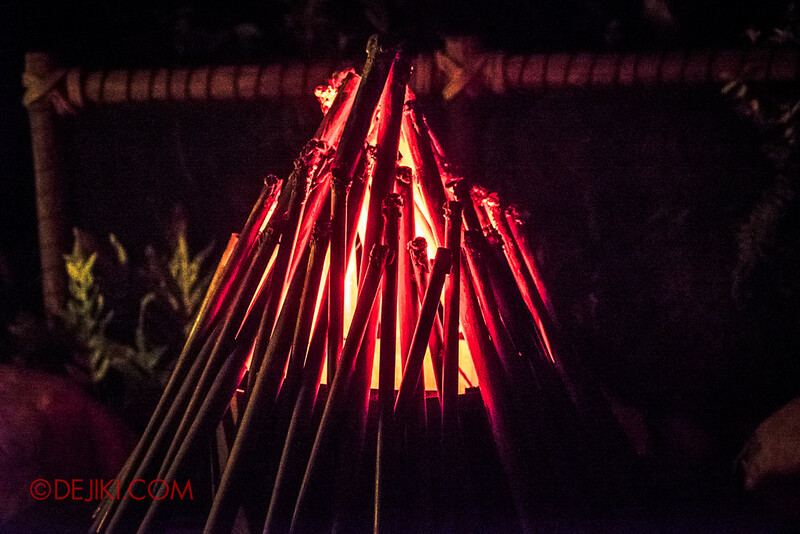 The Sarge told us to keep watch of the camp fire, or ‘beacon’ – it would glow red if zombies are nearby. Did I mention that throughout the entire night, the entire zone had music playing? It felt like we were in a video game. 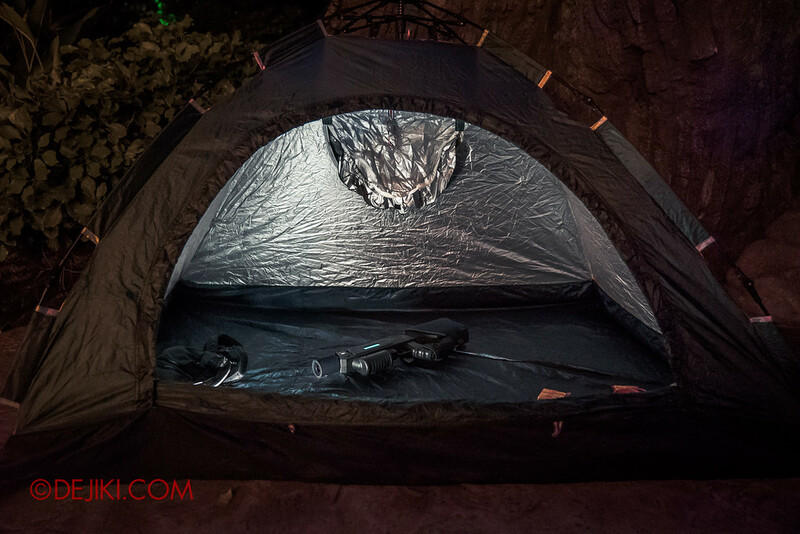 My tent for the night – below one of the big tree stumps at Jurassic Park. 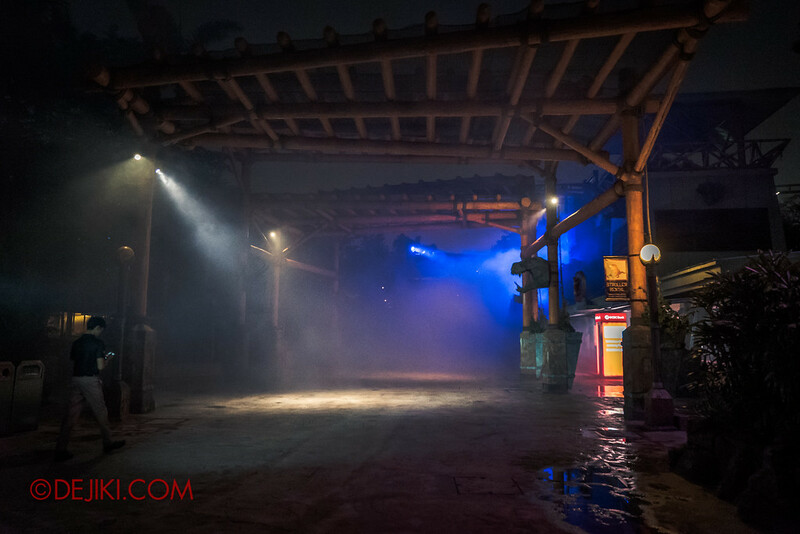 The MasterCard Priceless Draw winner – who happens to also read this blog for HHN updates 🙂 We were able to snap these photos leisurely because as you could see – the blue beacon. It’s safe. Then, the music completely changed. The beacon turned red. The Sarge quickly split us up to defend strategic points outside our camp. 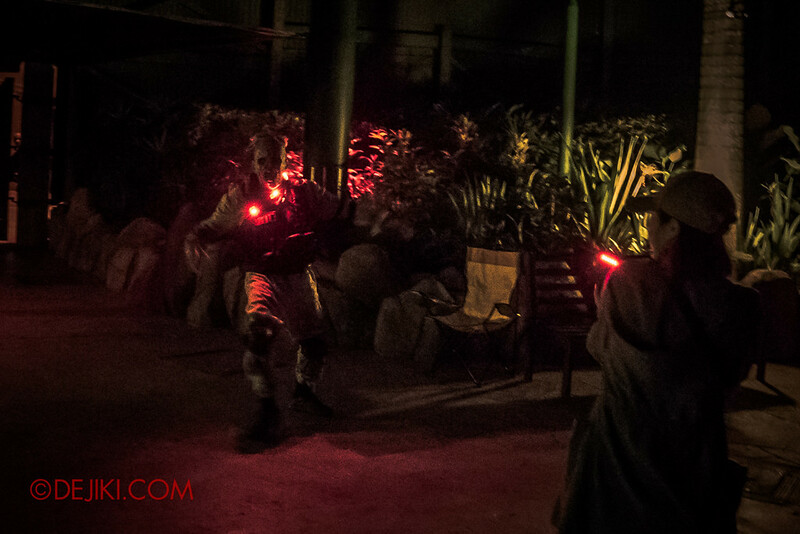 It was easy – we each had only one or two zombies to fend off. Feeling victorious, we went to Discovery Food Court for our chilling supper – really, it was cold ham sandwich and some rather disturbing ‘finger’ cookies. After this, we could head back to camp and finally catch some sleep. Or so we thought. 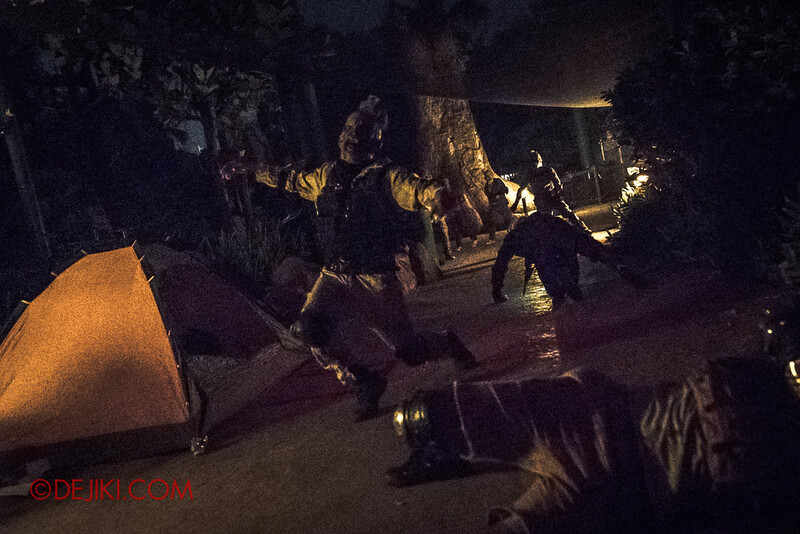 Once we stepped outside, a few zombies jumped right in front of us. 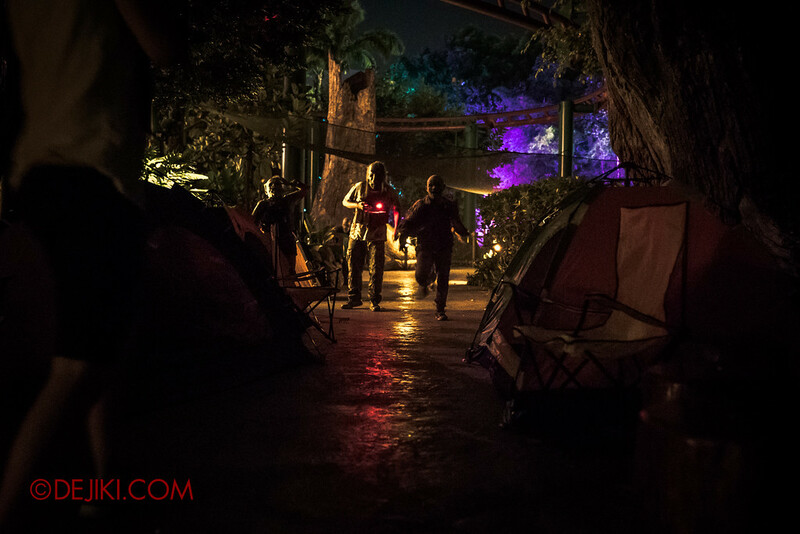 Not everyone had their rifles, so we had to rush back to camp through Jurassic Park. The path we took was swarming with zombies, so we had to take another way – through the haunted Easter Maze of Happy Horror Days. Well, the maze had more surprises. Once everyone made it out safely, we walked back to the campsite, which looked quiet and safe. The beacon was still glowing red. As we approached our tents, more zombies rolled out. They are getting smarter. After some pretty dramatic encounters, our camp is safe again for us – we really needed a break from the attacks! 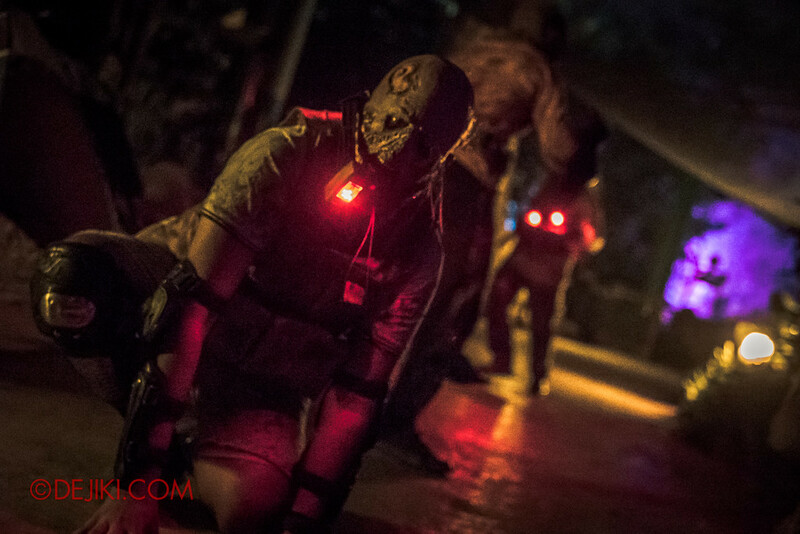 Our night was kept eventful with surprise zombie encounters – some without tactical support from our dear Sergeant, who was often away when we succeeded in defending the campsite from zombies. 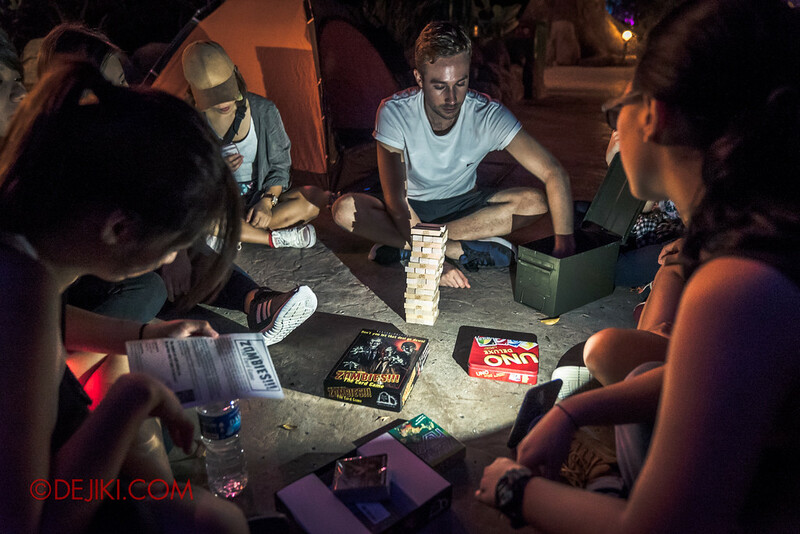 There were some peaceful moments during the overnight stay – we even tried to play board games. 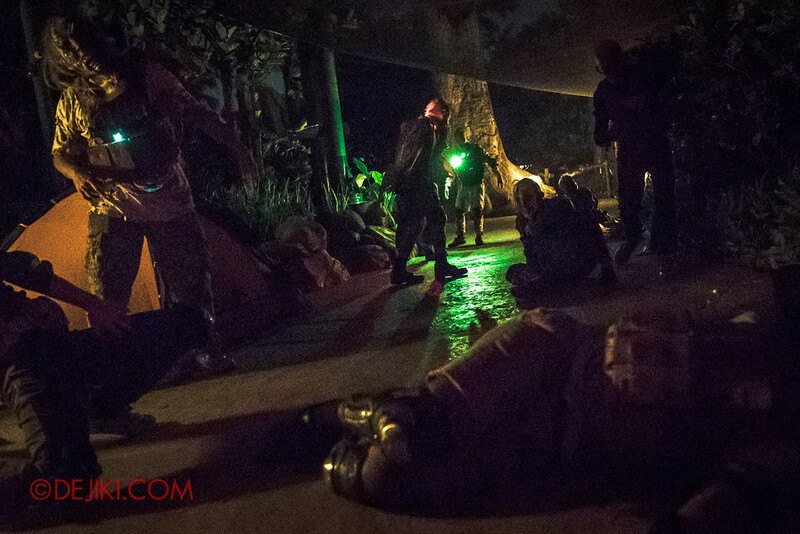 During the last few hours of our zombie survival experience, it became harder to battle the zombies. The horde grew after every wave. At long last, the Sergeant returns and scores a critical hit, setting a zombie on fire. 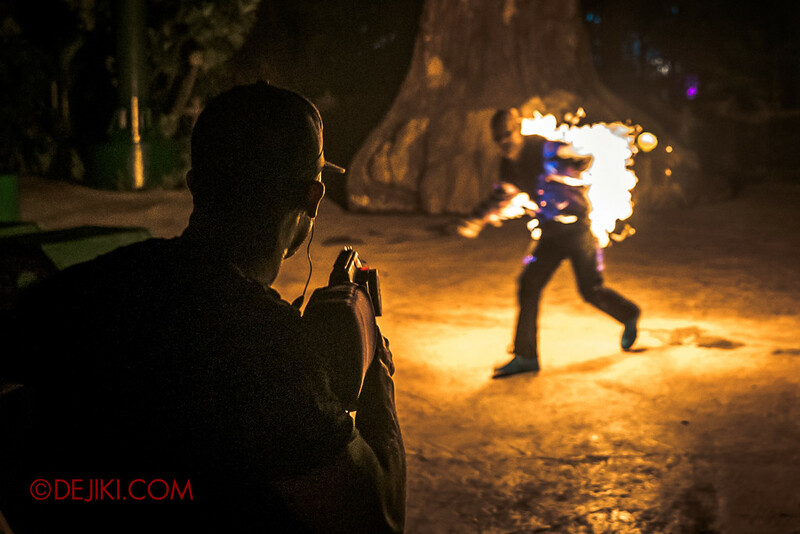 That flaming undead… summoned all the other zombies to strike. We truly had the fright of our (after-) lives. In the final wave, we were severely outnumbered – over 20 of them ravaged our campsite, and they were coming from all over the place. 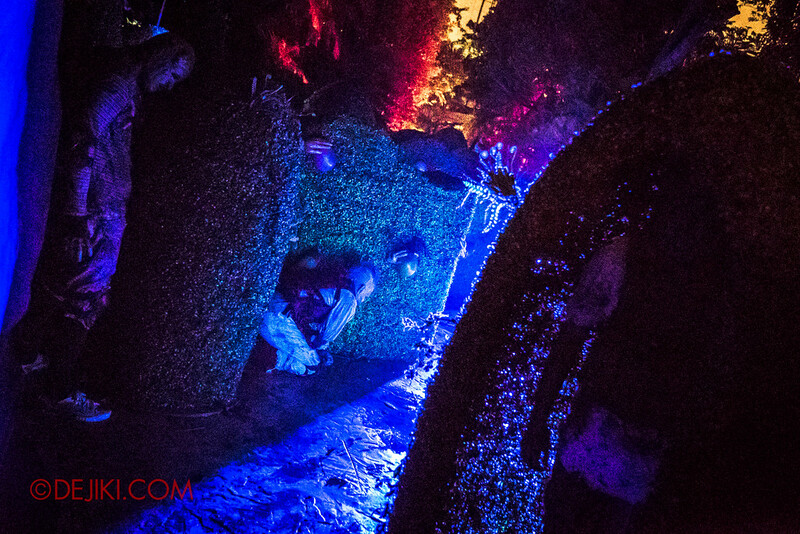 Between the bushes, dashing right through, or even somehow jumping out behind our tents. 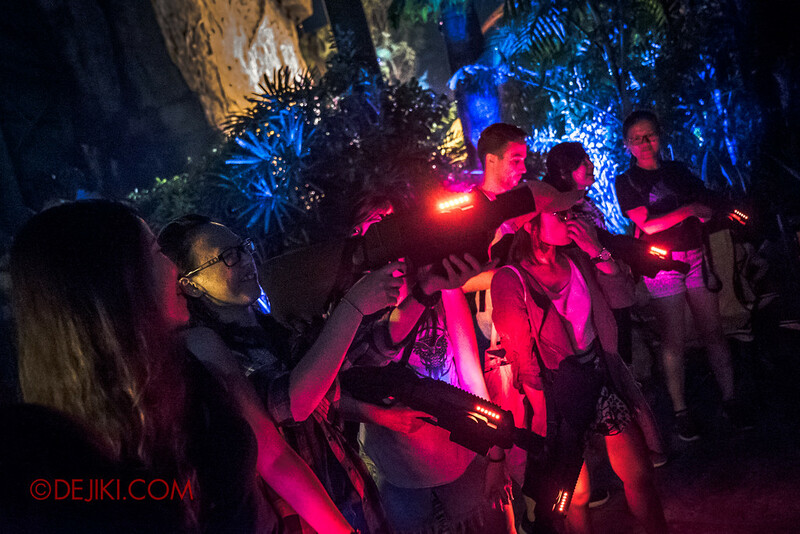 The regular Zombie Laser Tag experience at HHN7 lasts about 25 minutes. For the Priceless Experience, we had to survive a night full of encounters, until the sun rises. 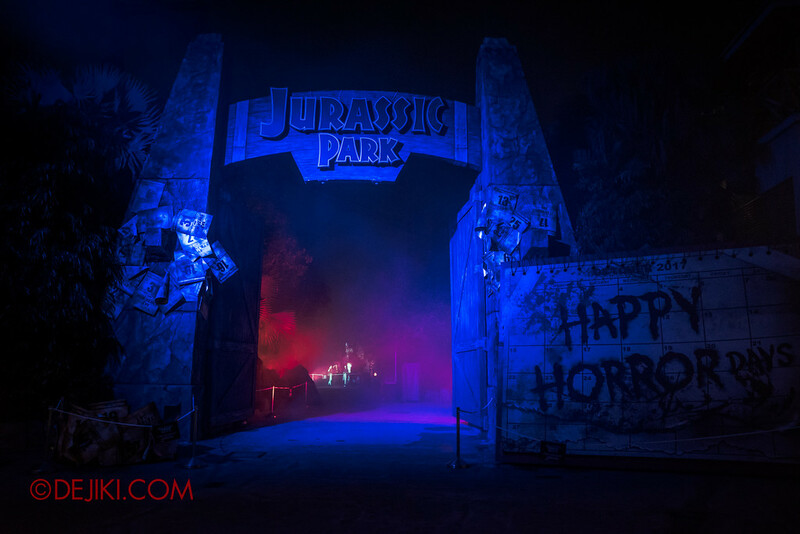 It was certainly an exhilarating experience, and I am sure there are thrill seekers and HHN fans willing to pay for this memorable stay. Let Resorts World Sentosa know that you’re interested! Perhaps in future editions, there could be more variation in the activities, having short missions, twists in the story (people turning into zombies?) or skirmishes taking place in other areas of the park. 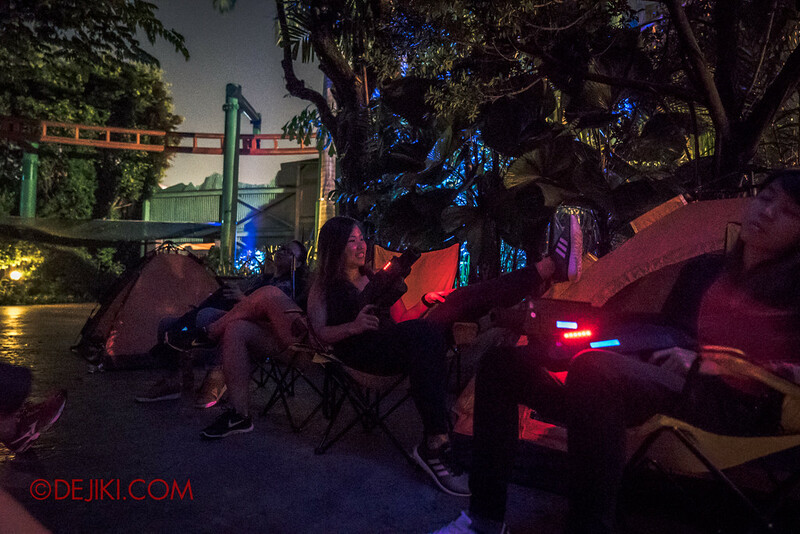 I hope that there will be a similar overnight HHN experience next year. Special Thanks to Resorts World Sentosa for the invitation to the HHN7 MasterCard Priceless Experience. Sequence of events condensed and modified for this article – it was after all a 9-hour experience.